This week, many of our readers are joining Marva and I in our challenge to Wake Up to Gratitude. We had a fantastic response to our email series and this week I am in prayer every day for the women who signed up. I am praying that a spirit of gratitude sinks deep into their souls. That they grab on tightly to the weapon of gratitude and use it against every last bit of yuck the enemy throws at them. I pray they choose gratitude over disappointment – what is rather than what isn’t. And I pray they claim the victory available in Jesus every single day. 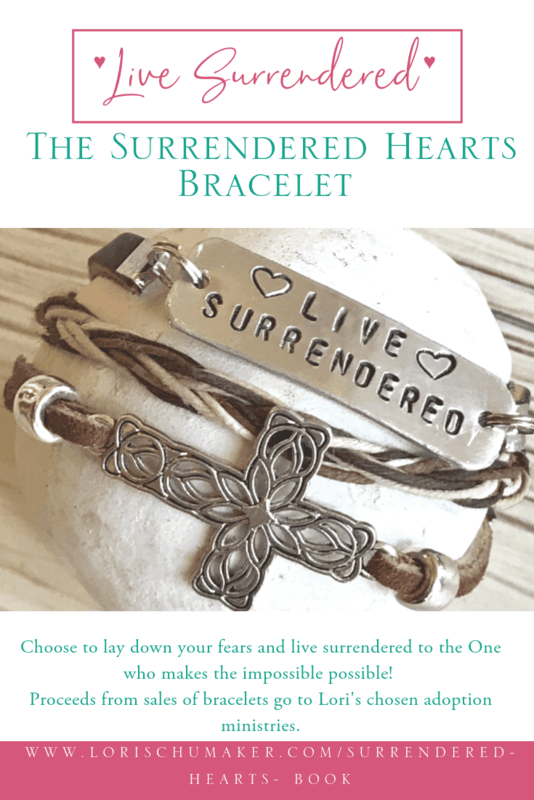 In the spirit of gratitude, I shared a post last week over at Leslie Newman’s Journey to Imperfect. Leslie and I have a heart for those who haven’t yet embraced the full truth of how wonderfully created they are in Christ. We both speak on the power of knowing our identity in Christ and how it refutes the messages we receive about ourselves from the world. The message we receive from Christ is steady and consistent. It’s unwavering. And it’s TRUTH! But the message we receive from the world comes from broken people trying their best to live each day. It’s not steady. Nor unwavering. And it is filled with the lies of the enemy. So, when Leslie asked me to share a post with her, I was happy and honored to do so! What I shared was the story of our scars. The life scars. The ones that we gather in a scuffle with life and deeply hurt and grieve our hearts. But yet, as we look back, remind us of all God has done in our life and all that He can and will do again. We each have scars that remind us of a story. A story we can share with others to give them hope. 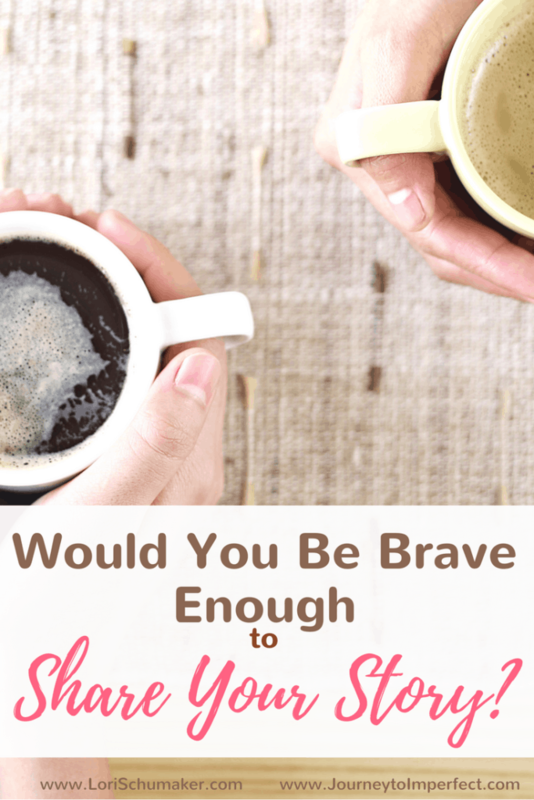 Would you be brave enough to share your story? Join me over at Journey to Imperfect as I share more about my story, the scars that remind me of all God has done, and why you should consider sharing your story instead of hiding your scars. 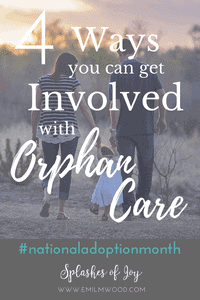 I know I’ve mentioned it a few times already this month and if you follow me on my Facebook Page, you see I am sharing as much as I can about National Adoption Month! Adoption is a big part of our lives and big part of our faith buy nolvadex ed walk. My story and walk with God started long before adoption as He walked me through many life challenges, but out of an obedience to the call He placed on my life, as a family we have witnessed God’s faithfulness, love, and miracles – all because of adoption. So today, I want to shine the light on fellow blogger, Emily Wood from Splashes of Joy. A fellow adoptive Mama and advocate for the over 100 million orphans worldwide, Emily is running a series titled simply #AdoptionStories the entire month of November. 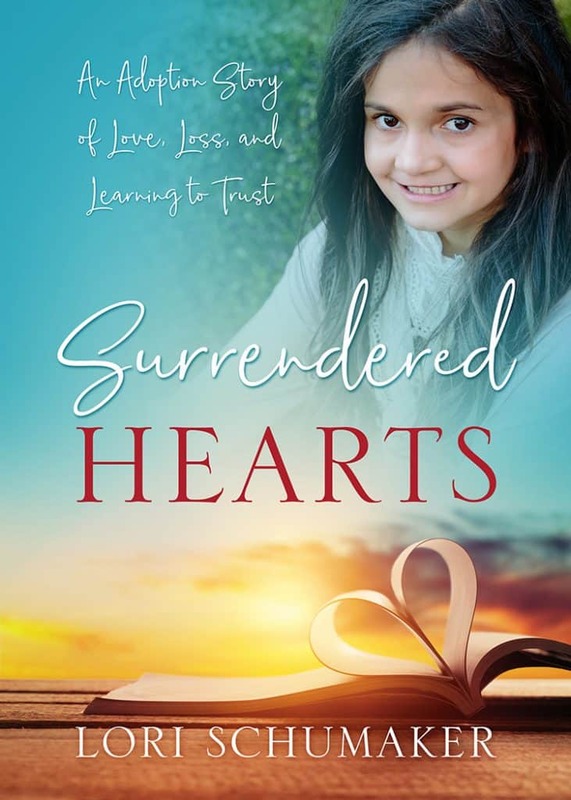 She is sharing stories of current and past adoptive families, as well as providing resources for ALL OF US. You may wonder why I say (in capitals) ALL OF US. It’s because the truth of the matter is that we are all called to care for the orphan. I dare you to stop by her page. Be careful, though, God may just meet you there! ? When you do, please don’t forget to leave her some #MomentsofHope style of comment love! The content you find here is designed to challenge you to live your best life. No stagnancy. A life that looks different. One that shines a little brighter with the hope, love, joy, and purpose we find in a life cultivated by Christ! It will push you out of your comfort zone and it will make you uncomfortably aware of the areas in which you need to grow. And best of all, you will know you are not in it alone. Not only am I here growing and learning right alongside you, but thousands of others are, too. I loved your explanation as to why we mucus the find our identity in Christ and not others because people are broken and imperfect. How true is that! I can not expect to get an accurate, full view of myself from someone who is looking through a broken lense. That is so good! Thank you for this week’s link up!!! Beautiful post, Lori! I have often said that my scars no longer remind me of pain but of what the Lord has done in my life. Mentally I know there was once hurt but now I only know the beauty God brought from it all. May many find hope in your words and through our Lord! I’m also thankful for my group of women who gather each week to share our stories and to remind one another of Truth. Blessings to you as you live in the light of God’s revelation and share His beauty. Thank you so much for featuring my post, Lori!!! I am truly honored!!! I’m so glad to know that you are highlighted over at Leslie’s place today, Lori! You have such a powerful message about our identity in Christ that touches me every time I visit here. It’s one filled with a Hope that all people need in their lives. Thanks for the linkup, my friend, and I’ll hopping over to read your post at Leslie’s next! Lori, thanks again, so much for sharing your heart with us last week at Journey to Imperfect! It is so encouraging to remember that we all have stories to share and that our scars are evidence of healing in our lives. Your post was a blessing to others and me, too! Thank you! I’ve never thought of gratitude as a weapon before, but INDEED IT IS! How wonderful to know that you are praying for those of us who have signed up for the Wake Up to Gratitude series! Loved this post Lori. Left you a comment at Leslie ‘s site. Scars can say a lot can’t they? I’ll be sharing this post too. Be well and God bless. Lori, Yes, I am willing to share my scars. I have found in doing so once in a blue moon I regret it but for the most part if is a positive experience. Not only do I help others I find what they have to give back is so rewarding to my life.